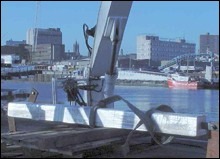 Aberdeen Foundries manufacturers a large range of anodes and bracket fixings suitable for cathodic protection of all steelwork below tide levels within ports, harbours and jetties. The anodes are made to fit within the recesses of the pile walls and can be welded on or mounted on special brackets to allow future exchange. Anodes for jetties may also be bracket mounted but can be cast as bracelets (like pipeline anodes) or fitted onto bracelet bands with specific fittings. Steel work for harbour pile walls and jetties was traditionally designed with an allowance for metal loss due to an even layer corrosion over the pile surfaces. It has since been realised that corrosion attack is not uniform and accelerated attack of pile wall installations has caused holes through piling structures which have compromised the structural integrity of port and harbour installations. There are currently many work programmes throughout the world which are installing cathodic protection to most seawater immersed structures in harbours. 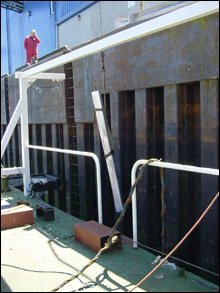 By installing sacrificial anodes the corrosion attack is able to be arrested and the future of the port & harbour installations assured. Most of the anodes suitable for harbour installations are modified designs of those anodes used for protection of frames, rigs and jetties used in the oil industry where cathodic protection has been used religiously. Aberdeen Foundries Data Sheets show examples of section sizes and all anodes can have inserts or fittings modified to allow direct welding or installation onto our brackets by diving contractors. The amount of protection required, anodes sizes and distribution can be made specified by using specific design codes common to the Oil & Gas and Marine industry (such as DNV RPB401) and recommendations on sizes, distributions and installation can be drawn up to meet your specifications. Aberdeen Foundries also offers a range of brackets, cables and fittings to suit these anodes, suitable for harbour wall, in-pans, skid mounting or bolt-on fittings to suit your application. We would supply all these to your drawings or design them for you.